DISCLAIMER: Please be aware that these pros and cons are what I would consider to be pros and cons. I'm expressing my opinion. I'm not expecting everyone to feel the same way by any stretch of the imagination. If anything the pros are more tongue in cheek. I have met so many beautiful, lovely and interesting people with the same interests and aspirations as mine through blogging - from all over the world. These are people I would never have had the chance to meet usually and I now think of them as friends. I even text and tweet a few other bloggers more than I speak to my actual friends - and I can't wait to meet them in person. I have met so many beautiful, lovely and interesting people. 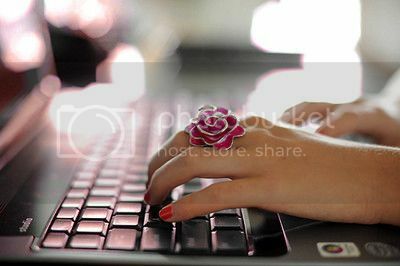 Blogging is my hobby. It's different and it's interesting and it's fun. Some people mountain bike whilst others read. I blog. It makes me feel like I'm sharing something with someone and that my opinion is valued. It's different and it's interesting and it's fun. Especially if you're going for a job that involves the subject that your blog is about it shows a wide knowledge base on the subject and a proven commitment to the subject. Even if your blog isn't linked to your career it shows you have outside interests. Even if your blog isn't linked to your career it shows you have outside interests. As, predominately, I am a beauty blogger I get ridiculously excited and giddy about the launch of a new lipstick or blusher. This may be seen as shallow by some people but a lifetime spent being excited is a lot better than a lifetime spent raising an eyebrow at someone else's happiness. Also, when you see something pretty - it's inspiration for the blog. When you eat something amazing you think about how you would review it. The world is suddenly one big inspirational mood board. The world is suddenly one big inspirational mood board. If someone asks me about the lipstick I'm wearing I can recite the finish (matte/sheer/creme/frosted), formula, shade name, shade number, brand, endorsing model and price - plus where it is mostly likely to be found and which shop is most likely to have it at a reduced price or on an offer of some sort. It sounds obsessive but it seems my ability to do this has come from writing post after post about all that information and it just somehow sinks in. And my friends seem to think this is amazing because I suddenly know where all of the best bargains are to be had. If someone asks me about the lipstick I'm wearing I can recite the finish, formula, shade name, shade number, brand and price. I have learned more about myself as a person - my likes and dislikes - since I started blogging than I ever really knew before. I think there is definitely something to be said for that. Since I'm documenting everything and writing reviews/opinions I am finally making proper decisions about things, forming proper opinions and surprising myself at the same time. I have learned more about myself as a person - my likes and dislikes - since I started blogging than I ever really knew before. I'm using cameras more that I ever used to now - and using apps like Instagram means that I am starting to take more notice of the little things - like a pretty flower or a cookie or a cute pose the cat is pulling. Its helping me to appreciate day-to-day things too. It helps me to appreciate day-to-day things. If you had all met me a year ago there is no way that I would have been posting pictures, largely unedited, on the internet for strangers. Even my private Facebook was seriously vetted - photos that I didn't think were fun or flattering simply weren't tagged or posted. Now I post pictures of myself on this blog without thinking twice really. There is no point not putting my mug on here, especially as the whole point is to showcase the latest lip colour or what I'm wearing that day. My self-esteem is far better than it ever has been. My self-esteem is far better than it ever has been. I always try to photograph everything before I use it so I can blog about it. It does sometimes hinder me. Especially when I desperately want to try something out but because the light is fading it won't take great photos and therefore I have to leave it until later or the next day or three days later! It does sometimes hinder me. Especially when I desperately want to try something out. Everything everything everything has to be swatched before it is bought - especially if it is drugstore. I often walk out of shops with what looks like I have a tropical disease manifesting itself in a rainbow of colour on the back of my hand. It gets on the cuffs of my clothes, glitter migrates towards my face. In short swatches get everywhere and sometimes its not always a good thing. I often walk out of shops with what looks like a tropical disease manifesting itself in a rainbow of colour on the back of my hand. Unfortunately because your blog is on the internet a lot of people can get to it and read it. Unless it's a private blog - in which case no one else would be able to read it apart from you. People will naturally be mean sometimes and although most of the time it's easy to delete, it can be hard to forget what was written. Thankfully there are more good times when blogging than bad ones. On this note, there will always be differences of opinion when it comes to blogging, no matter what you're blogging about. Agree to disagree and move on. Sometimes it's just not worth the hassle. People will naturally be mean sometimes and although most of the time it's easy to delete, it can be hard to forget what was written. Anything new that comes out just has to be spent on. I have to have that new lipstick. Even though it's incredibly similar to the two others named 'Rose Pink' that I already have from other different collections. The bank manager won't be very happy but you will be (and that's what counts right?). Anything new that comes out just has to be spent on. People start their blogs about a particular topic or niche because they're interested in that topic - that's why I write about beauty. Sometimes though I just get sick of reviewing makeup. I know that sounds silly seeing as I blog about it but occasionally I look at a new product and think 'I genuinely don't think there is anything new or exciting about you that someone else hasn't already written'. Maybe that's just me? So I will have a break and step back for a few days. After that I'm raring to go. This is by far my biggest bug-bear and friends of mine know I can spend hours ranting about this. I'll try to be as brief as possible. Some people (not everyone - a lot of other bloggers are amazing and don't do what I'm about to say) turn blogging into some sort of competition. They bully others to get their own way - especially on Twitter, pressure people into following them and their blog, think they have the right to voice their opinions on every little minute thing - and therefore create this atmosphere of competition. I get that there aren't an infinite number of samples and therefore the better the stats and higher the number of followers a blog has the more likely you are a blogger to be taken seriously by brands. That doesn't mean bloggers should go around making others feel belittled if they don't happen to agree with everything that say or write about. Also, blogging is supposed to be fun - not a way of getting freebies whatever form they take. This is probably the biggest con of blogging for me personally - the people who use it as a way to get hold of stuff they don't want to use personal money to purchase - and bully and manipulate others into helping them do it by pressuring them into following their blogs. This is probably the biggest con of blogging for me personally - the people who use it as a way to get hold of stuff they don't want to use personal money to purchase - and bully and manipulate others into helping them to do it by pressuring them into following their blogs. Has anyone else got anything to add to this post at all? I know I went a bit ranty on the last part of the cons session but bloggers like that genuinely make my blood boil. Have you found any pros or cons to blogging? Comment below if you have! I'd love to hear them! This was brilliant! I loved the parts about swatching and not being able to use a product until you have photographed it, so true! The whole competing things winds me up too. Anyone who gets stressed about not having enough followers/being sent PR samples is being silly. I blog because I love writing and am addicted to buying make-up/clothes/everything girly and it's a great outlet to talk about it with like minded people. Sure it's always lovely to gain new followers and see an increasing number of readers but it shouldn't be the main focus. Also I have never been sent a PR sample and wouldn't care if I never got offered one. I blog for me, not for the freebies! If you really don't want to blog about beauty the whole time, you could always include some new things in there? That's what I did when I got fed up with just beauty and events, I eat out an awful lot and always have a huge opinion on the food I'm eating, so decided to start doing restaurant reviews as well :) having lots of different things to blog about stops me from getting bored of it! I feel so lucky to have had my blog for almost a year and not to have experienced any nastiness from anyone. I honestly expected it to have happened by now. I guess that I'm still fairly 'new' in terms of numbers though so I'll probably get some hate really soon! The money side of blogging is definintely the worst part. I never have any spare cash, which isn't good when you have a 9 year old daughter and a baby on the way. I don't tend to photograph things straight away by the way ... I like to see tried and tested things as well as new stuff so I'm not strict about photographing before I try something! loved reading it! one thing I have to agree on is never having spare money and waiting to use a product till you photographed it! I can completely relate to everything you said throughout this whole post.. Really makes you think about blogging in a different light but in my opinion congratulations to anyone who blogs! I must confess, I do sometimes use my products before photographing them - I like to live life on the edge, haha. But seriously, products are bought to be used, and I obviously will have used it by the time the post is published anyway because I have written a review on it. I do try to keep them looking their best though! When you talk about bloggers pressuring others into following their blogs, in what sense are we talking? Do you mean those people who drop by just to leave follow for follow comments and the like? Yeah, I mean follow for follows or deliberately tweeting people to say 'Why aren't you following me??' Or 'You really should follow me if you're interested in x, y or z' - its happening too freqently at the moment! What a great post Helen - I've been engrossed from start to finish and agree with you on pretty much everything! That 'Inspirational Mood Board' - so true! I know exactly what you mean about taking a break and coming back raring to go - I can't just churn out review after review - it's just not me and I have to do it as the mood grabs me and then I'm away ...! Does that make any sense? Great post hun. I agree there are pro's & con's to blogging. Definitely more pro's though (Otherwise I wouldn't bother lol). I get what you mean about the boredom. Sometime I get a little fed up of product review after product review. That's when I try to write skincare advice post or my '7 best British Brands' type post, just so I don't get too bored. Hey - found your blog through us both being awarded the Leibster Award by Holly from http://impatience-is-a-virtue.blogspot.co.uk/. Following you as Jessica Knox.